Only a few elements are widely used commercially in their pure form. Generally, other elements are present to produce greater strength, to improve corrosion resistance, or simply as impurities left over from the refining process. Information about means of strengthening a metal is given in this article. The information about means of strengthening is already covered in various articles on metallurgy. This article is written to summarize the information at one place. The strength of a metal/alloy can be described as the resistance against the onset of plastic deformation under an external load. Plastic deformation occurs by the movement of dislocations through the metal (in this article, generally metal word will be used for metal or an alloy) lattice which enables single lattice planes to slip consecutively over one another. If this motion is hindered by lattice defects, a higher external load must be applied so that the dislocations can overcome the obstacles. It is for this reason that means of increasing the strength of steels always aim at hindering dislocation movement. Various obstacles to dislocation motion are as per the table given below. Solid solution strengthening occurs when the atoms of the new element (solute) form a solid solution with the original element (solvent), but there is still only one phase. The increase in strength is produced by solute atoms which are dissolved in the metal matrix (solvent). Since solute atoms differ in size as compared to the atoms of metal matrix they introduce tensile or compressive lattice strains (lattice distortion) that hinders the movement of dislocations. The increase of yield stress depends on the kind, amount and distribution of the solute atoms. Solute atoms, those dissolve interstitially between the atoms of the matrix results in a high lattice distortion (e.g. C and N) as compared to others which dissolve substitutionally and occupy regular lattice positions (e.g. Cr). Increasing strength by solid solution strengthening leads to a decrease in toughness (Toughness is the ability of a material to avoid brittle fracture. Toughness = Strength + Ductility). Linear lattice defects are the dislocations themselves. The lattice distortion surrounding the dislocation disturbs the movement of other dislocations. A dislocation in the path of other dislocation can act as an obstacle to the motion of the latter. This interaction increases with increasing dislocation density. When cold forming steel, e.g. cold rolling, dislocations are continuously produced because they permanently block each other. The dislocation density rises and increases the strength of the steel. Such strengthening is accompanied by a pronounced reduction in toughness. Grain refinement is the most important strengthening mechanism because it is the only method of strengthening which is accompanied by an increase in resistance to brittle fracture. The toughness of the alloy also increases as grain size decreases. As shown in the figure given below, slip planes do not cross from one grain to another but are confined by the grain boundaries. Due to this, in large grains there is more slippage and greater plastic deformation. In small grains, slip process is confined and results in small slippage. 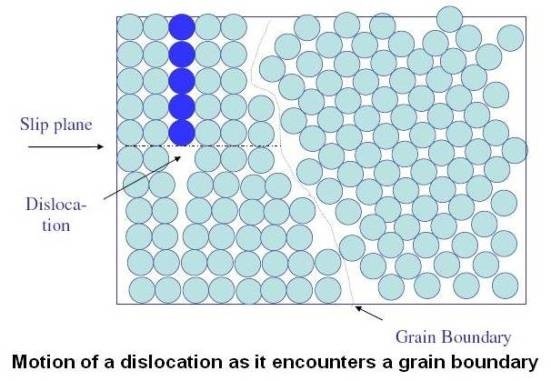 During plastic deformation, slip or dislocation motion must take place across the common grain boundary, which acts as a barrier to dislocation due to two major reasons. Atomic disorder within a grain boundary resulting in discontinuity of slip planes. Thus the grain boundaries are barriers to dislocation motion. Consequently as the grain size is decreased, the number of barriers increases and this is reflected in increased yield strength. It may however be noted that fine grain size is not desirable for creep resistance as grain boundary sliding can cause creep elongation/cavitation. Precipitates are obstacles to the motion of dislocation. There are two mechanisms for strengthening by this method â€“ Multiphase Metals and Precipitation Strengthening. In this method, strengthening the metal is carried out by adding elements that have no or partial solubility in the parent metal. This will result in the appearance of a second phase distributed throughout the crystal or between crystals (e.g. Fe3C, called as Cementite). This secondary phase can raise or reduce the strength of an alloy. The properties of a polyphase (two or more phase) material depend on the nature, amount, size, shape, distribution, and orientation of the phases. In designing alloys for strength, an approach often taken is to develop an alloy with a structure that consists of particles (which impede dislocation movement) dispersed in a ductile matrix. Such a dispersion can be obtained by choosing an alloy that is a single phase at elevated temperature but on cooling will precipitate another phase in the matrix. A thermal process is then developed to produce the desired distribution of precipitate in the matrix. When the alloy is strengthened by this thermal treatment, it is called precipitation strengthening or hardening. Precipitation hardening consists of three main steps: solution treatment, quenching, and aging. Solution treatment involves heating the alloy to a temperature that allows the alloying atoms (called the solute) to dissolve into the solution. This results in a homogeneous solid solution of one phase. Quenching rapidly cools the solution and freezes the atoms in solution. In more technical terms, the quenching cools the material so fast that the atoms of the alloying elements do not have time to diffuse out of the solution. In the as-quenched condition, the solute is supersaturated meaning that the lattice is overly stressed by the alloying atoms. Aging is the process where the solute particles diffuse out of solution and into clusters that distort and strengthen the material. Solute atoms in a solid solution and precipitates both are obstacles to the motion of dislocation. However precipitates are having pronounced effect on strengthening. The strengthening by the two methods can be compared by a real life example â€“ difficulty with pebbles and boulders on a road.